From the humectant properties of honey to the nutrients of royal jelly, this light, non-greasy cream works to smooth your skin, seal in moisture and combat flakiness. 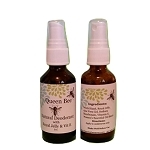 Also contains jojoba oil, propolis, aloe vera and bee pollen. 8 oz.